I am lucky enough to live in the north of England. I was born in Belgium, and grew up in Wales. My father died when I was young, but my mum re-married and that man is very much my dad. I’m female. I play and teach the harp for a living, and my name on here is harple (NOT harpie!). 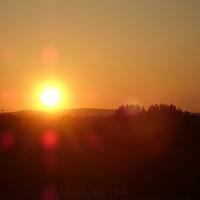 My avatar is a photo of a sunset I took in 2010, when I joined this site. I can speak Welsh fluently, and once learned British Sign Language, but sadly haven’t used it for some time. Would you like to support your fellow jellies with a group hug? Who's gonna let us guys know when you die (read on!)? Which is worse: To love more than you are loved, or to be loved more than you love? July 27th, 2012 Great Answer (15 ) Answer to Well, Nullo! Look who made it to the 20K Mansion! It’s about respect for what you had, and the person you are “dumping”. Login to send a message to harple. I’m back and trying to get back to normal as quickly as possible. I was pleased to get a decent cup of tea mind you!!! Sat in Las Vegas airport as we speak! Very sad to be coming home, it has been an amazing trip!